Mike will speak about the marketing components of making an organization grow and in doing so, transform individuals, organization and communities. 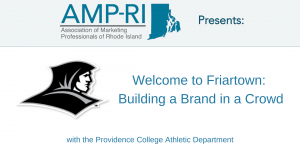 Leadership Rhode Island has grown over the years into a nationally recognized organization. Mike will discuss The Make RI Stronger Campaign and how LRI has and continues to engage and connect with people through shared positive experiences. Mike just completed his eighth year as the Executive Director of Leadership Rhode Island. Under his leadership, LRI has received many accolades to include the Excellence in Public Service Award by Common Cause RI, the National Innovation Award by the Association of Leadership Programs (twice), two Community Outreach Awards by the RI Press Association in partnership with The Providence Journal and Rhode Island College, and this past year was recognized by Gallup as an inspiration for the “15 million and growing” global strengths movement. Appetizers will be served and a cash bar will be available! If you pay 24-hours in advanced, no. We will keep a record of those who purchased a ticket at the door and confirm your payment then. Can you tell me a little more about what to expect? Sure! We meet for about two hours, but follow a typical flow: between 5:30 – 6:10 people arrive, grab some appteizers to snack on, and network with others; from here, our guest speaker will present and take questions until about 7pm. At this point of the night, our program is complete, but you are welcome to stay and chat longer, or spend time at the restaurant or bar as much of the crowd will do. How does AMP-RI membership work? Annual members pay a single, $60 fee for the year and attend all events free! That’s a great value financially. However, you also get great benefits such as discounts to special seminars, free exposure through our website, and access to a network of over 500 local professionals and business owners to post job opportunities or share your own resume. Non-Members: $15 online or $20 at the door. Students: $10 online | $15 at the door. Pre-pay for your event fees here.